In May 2016 I joined a small team from WAE / Globant, tasked with overhauling the online services provided by the London Metropolitan Police (the Met). 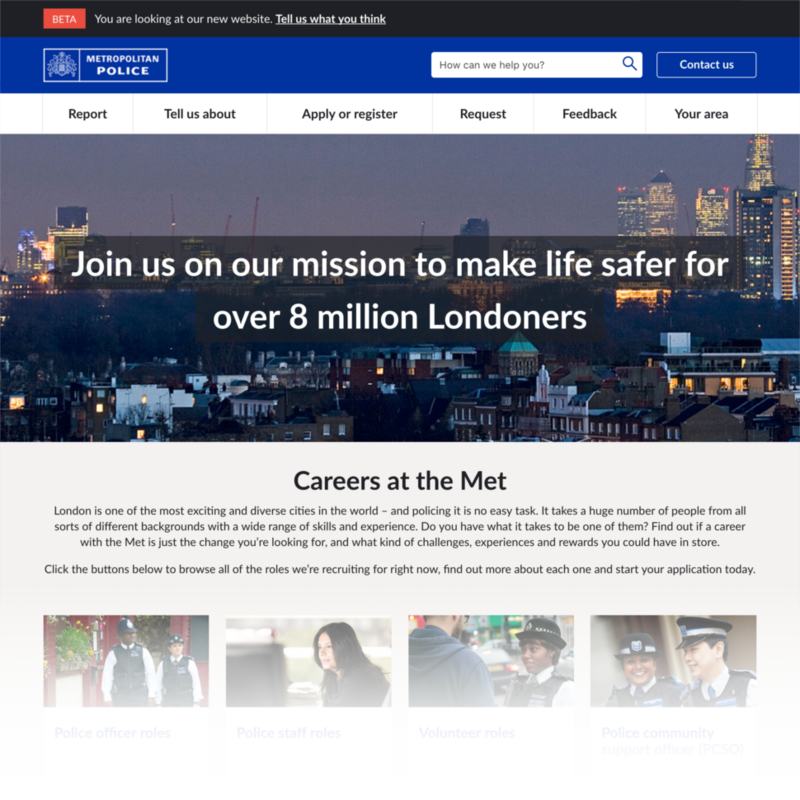 A brand new website would serve as the Met’s digital front-counter, offering a suite of new tools and information to improve transparency and increase collaboration between the police and the people of London. I was responsible for content across the site, from the dozens of redeveloped advice pages to the many new tools and processes (see below). The first complete iteration of the website went live in March 2017. 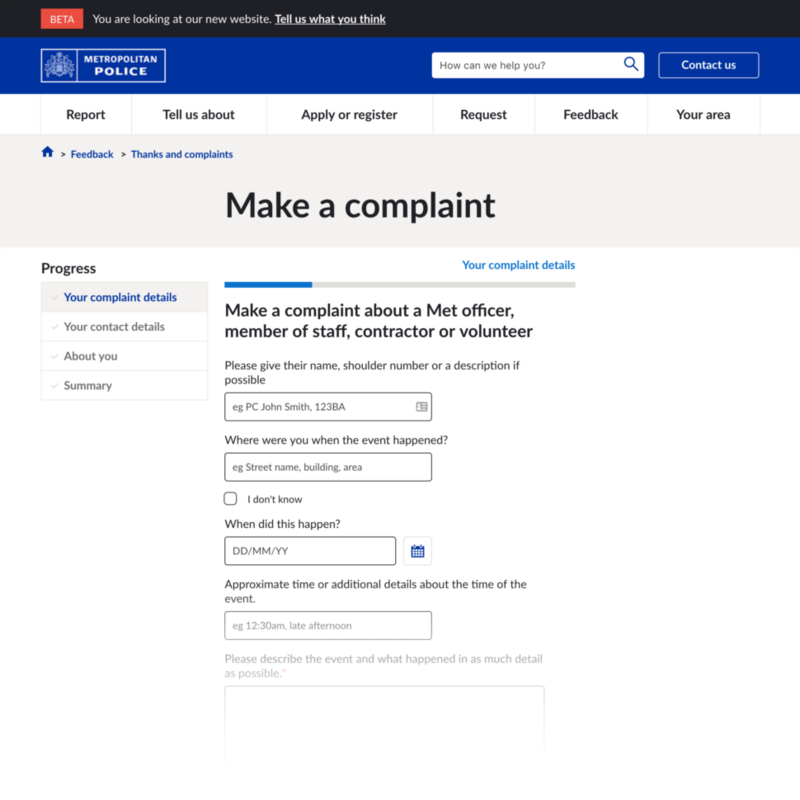 Our first step in redeveloping the Met’s advice pages was to establish a clearer, friendlier tone of voice that would make the whole site more useful and accessible to the general public. We then stripped out all extraneous visual clutter to make the information the focus. Templates agreed, we liaised with subject matter experts across the Met, from events licensing to child protection teams, to find the best and most sensitive ways of representing their particular field and expert advice. It was then up to me to write all the new content. 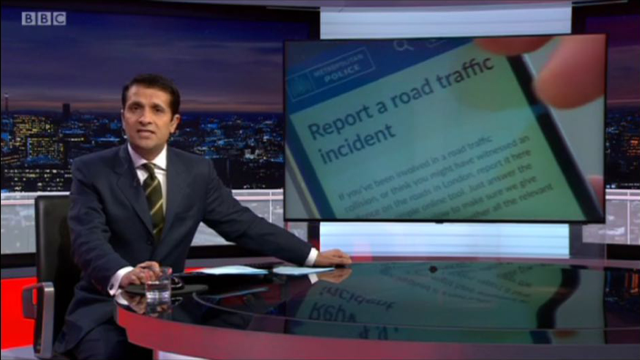 In December 2016, one of the new services I helped to develop for the Met was the lead story on BBC London News. The new service allows anyone involved in an accident or altercation on the road in London to notify the police online. For the public, it’s a simpler and faster way to notify the police. For the Met, the new service lowers operating costs by reducing admin time and increasing the quality of information being gathered up front. The police deal with thousands of different types of forms. As a member of the public, finding the correct one and completing it successfully can be a massive pain. The online triage tool we developed allowed us to break down often very complicated subjects and processes into simple questions and answers. This format helps users navigate quickly to the information, or the all-new online forms, they need. Through user testing and analytics we found people were also using the triage tool to self-educate, helping to reduce calls to 101.
Who doesn’t love a form? Almost everybody, it turns out. Which is why we ran workshops with dozens of teams across the Met who regularly use paper forms as part of their service, to find simpler approaches, improve efficiency and reduce operating costs. Though still far from perfect, the huge range of new online forms is already improving processing time, reducing errors (on both sides) and providing users with a more transparent service. 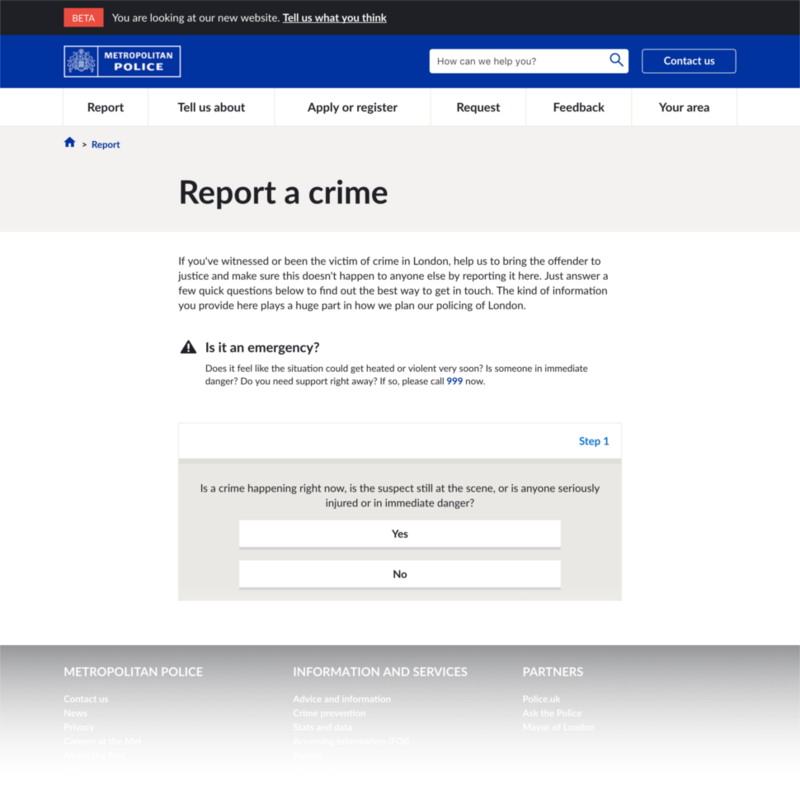 In particular, the ‘Report a crime’ triage and form together represent one of the most sophisticated online crime reporting tools in the world. 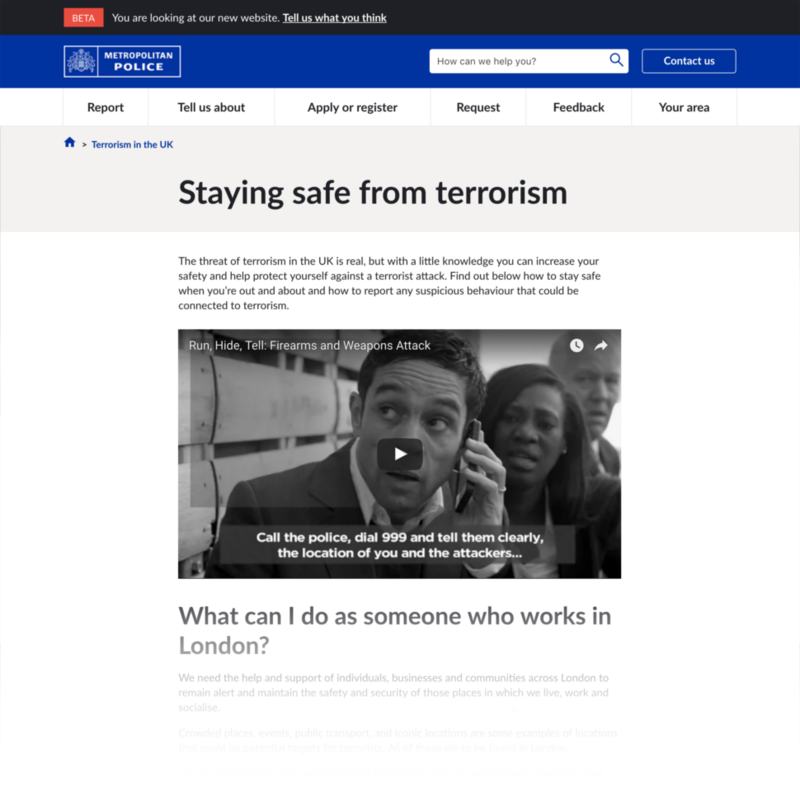 I worked with Ben to deliver the new website for the Metropolitan Police and I would confidently say that it wouldn't exist without him. He was involved in just about everything: From making content easy to find by helping to develop the information architecture and taxonomy of the whole site, simplifying subjects like fraud and data protection, writing advice for many sensitive topics such as child abuse and hate crime, to responding to participants during the testing of a live chat feature. Oh and he was also integral to designing and delivering the new online crime reporting tool. Ben is a goddamn powerhouse. I was heavily involved in all of the features above, but they aren’t nearly as exciting as the other new tools that we as a team created. Your area, for example, is a section of the website where users can find up-to-date, interactive crime stats on their ‘ward’ (the area covered by their local police team), including the top three crimes and tailored advice on how to stay safe. The Careers section of the site gave us a chance to use a fresh new wave of post-beta CMS components, including pagination. It doesn’t sound very exciting, but it allows the user to navigate large amounts of information quickly. It’s early days, but prospective Met employees and volunteers should soon be able to learn all about the roles available and apply for a role directly through the website.